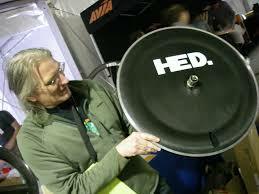 "So sad to hear of Steve Hed’s passing. He had a brilliant engineering mind and was happy to talk shop while showing me his bike museum,” said Chad Haga (Giant-Shimano). "Steve Hed, your passion, your generosity and your genius will not be forgotten. So sad to lose you. Rest in peace my friend,” said Taylor Phinney (BMC Racing). "RIP Steve Hed. #theguru. Such a loss. Heart felt sympathy to close friends and family,” Greg Henderson (Lotto-Belisol) said. That's very young for a guy who was apparently so into fitness. His blood cells probably weren't riding single file and clogged up an artery..
One of the key innovators in aerodynamic wheel design and construction. Prayers out to his family and friends. Also goes to show that if you eat right and exercise daily you'll die anyway. That H3 was a hell of a front wheel. They didn't doll up his accomplishments, either. He was first to use the toroidal rim, which Zipp then evolved into their firecrest design, a design that greatly reduced the handling problems in wind of deep rims. His company popularized wider clincher rims for general road use with the Ardennes and Ardennes+ design. Both of these tech innovations are copied by dozens of manufacturers. He was cool enough to sit and talk to anybody who wanted to talk to him at trade shows. I worked a few Interbikes back in the day and he was probably the only 'industry god' who would actually enjoy people asking him questions about his wheels and research. Also has my vote for wheels that always looked the fastest. Reminds me of Dr. Jim Fix (or Fox) who was an avid runner in the '80s. He dropped dead suddenly too. Jim Fixx, at age 49. Also, Sheldon Brown, who died of a heart attack at the age of 63. Terry Fox. Lost his leg due to cancer. Embarked on a run across Canada to raise awareness to the disease. He was into fixed-gear before it was cool. Reminds me of Yule(sp) Gibbons. Fixed gear was always dorky. A nine millimeter bullet may expand but a forty five will never shrink.